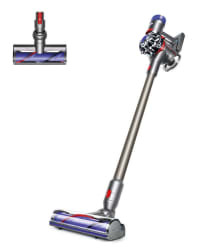 Dyson via eBay offers its refurbished Dyson SV11 V7 Animal HEPA Cordless Vacuum in Iron for $189.99. Coupon code "HOME20" cuts that to $151.99. Plus, you'll earn $15.10 in Rakuten Super Points. With free shipping and assuming you'll use the credit, that's $28 under our mention from Black Friday week and the lowest price we've seen. (It's $43 under the lowest price we could find for a refurb elsewhere.) It can transition from a stick vac to a handheld vac. Note: A 6-month Dyson warranty is included.